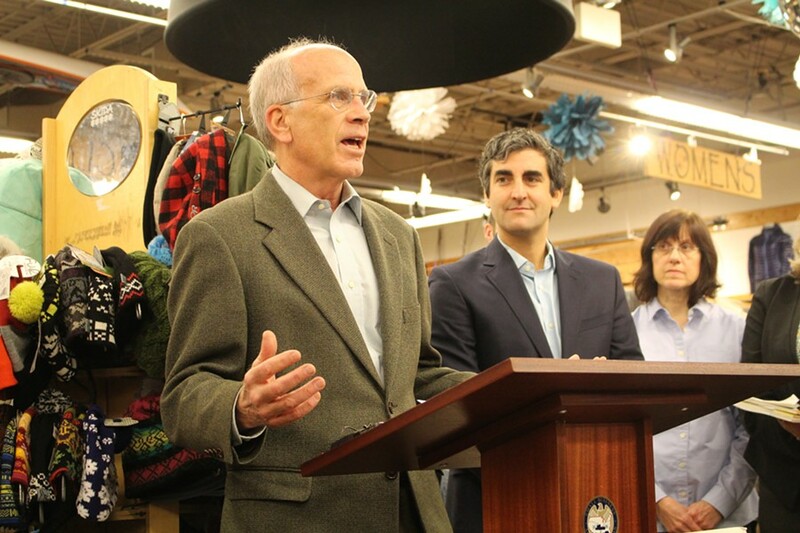 Congressman Peter Welch speaks at Burlington's Outdoor Gear Exchange in November. Congressman Peter Welch (D-Vt.) joined 138 House Democrats Thursday night in opposing a $1.1 trillion spending bill derided by liberals for weakening banking and campaign finance regulations. The legislation, which will fund the government through next September, narrowly survived a procedural vote Thursday afternoon as House Minority Leader Nancy Pelosi (D-Calif.) spoke out against it. After President Obama joined House Speaker John Boehner (R-Ohio) in personally lobbying for the bill, it passed by a vote of 219 to 206 — just hours before a midnight deadline to avert a government shutdown. The Senate is expected to vote on the measure Friday or Saturday. Sen. Bernie Sanders (I-Vt.) told national news outlets Thursday that he, too, would oppose the bill. Sen. Patrick Leahy (D-Vt.) helped negotiate portions of it as the most senior member of the Senate Appropriations Committee. In a floor speech Thursday, Leahy called it "a balanced, bipartisan bill." Opposition to the spending bill — dubbed the "cromnibus" because it combines a stopgap "continuing resolution" with a government-wide, or "omnibus," appropriations bill — has grown in recent days due the inclusion of two controversial policy provisions. One would roll back Dodd-Frank financial regulations barring the government from insuring Wall Street's riskiest financial instruments. The other would drastically increase the amount of money a single donor could give to national political parties. "This is exquisitely reckless — a special provision for Wall Street in exchange for money from Wall Street," Welch told the Huffington Post on Thursday. "I will say a very, very loud no," Sanders told MSNBC's Ed Schultz Thursday evening. "I believe the American people want us to do better and believe that we should do better." Leahy has not explicitly stated how he will vote on the spending package. 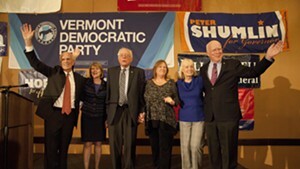 Spokesman David Carle said Thursday that Vermont's senior senator "detests the banking and campaign finance riders" in the bill, but that Democrats "generally feel we have far more leverage in getting the good things in this bill accomplished now, than we will have next year, if this bill were to fail." Republicans are poised to take control of the Senate in January. In recent days, Leahy's office has been trumpeting his success in inserting several provisions into the bill that would help Vermont. Among them are $3 million in additional funding for Lake Champlain; the creation of a new, federal "Anti-Heroin Task Force"; and the tripling of federal funding for crime victims. Liberal blowback against the legislation puts Leahy in a tricky spot. As a member of the Appropriations Committee — and chairman of its State Department and Foreign Operations subcommittee — he would have a difficult time voting against it. On Thursday, he defended the process that led to its drafting as he outlined elements of it on the Senate floor. "This bill was negotiated with the full participation of representatives of both parties, in both houses of Congress. It is a balanced, bipartisan bill," Leahy said, according to prepared remarks. "Every word was discussed and agreed to by Republicans and Democrats, and our respective bills have been publicly available since they were reported out of committee in June." One last-minute change that Leahy, the Senate president pro tempore, surely doesn't like is the elimination of $280,000 in funding for his own staff. In 2001, when the late senator Jim Jeffords switched party alliances and threw control of the Senate to the Democrats, Republican senator Strom Thurmond lost the ceremonial pro tem position to Democratic senator Robert Byrd. As a courtesy to Thurmond, according to the Washington Post, he was named "president pro tempore emeritus" and provided an office and a roughly $280,000 budget. Bird and senator Ted Stevens later filled the emeritus role and, now that Republicans are set to retake the Senate, Sen. Orrin Hatch (R-Utah) will become pro tem and Leahy will become pro tem emeritus. According to Carle, Sen. Mitch McConnell (R-Ky.) "at the 11th hour jumped in" to negotiations over the spending bill and attempted to loosen campaign finance regulations further. As leverage, Carle says, McConnell stripped the pro tem emeritus funding, but Leahy wouldn't budge. If the bill passes, Leahy will retain the emeritus title, but will not be provided additional staff. "They didn’t keep their commitment. They want to treat us differently than we treated them, and so they’ve got that right. It seems kind of petty, but it really doesn’t matter to me," Leahy told Roll Call. "I’ve got plenty of funding, plenty of good staff."